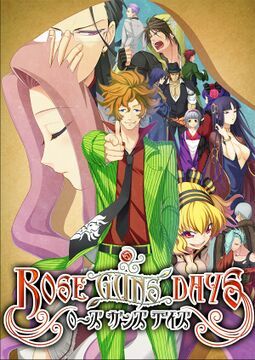 The cover of Season 1, the first Rose Guns Days released. Rose Guns Days (ローズガンズデイズ, Rōzu Ganzu Deizu?) is a Japanese alternate history dōjin soft visual novel series written by Ryukishi07 and produced by 07th Expansion. The gameplay in Rose Guns Days is primarily spent on reading the story's narrative and dialogue. The text is accompanied by character sprites over background art made from altered real-world photographs. Throughout gameplay, the player encounters a quick time event minigame of a fist fight battle sequence. The outcome of these minigames does not influence the progression of the story, and the player even has the option to skip them. The minigame has two parts: attack and defense. After the player successfully attacks three times, the player can then perform an overkill attack whose power is determined by the choice of one of six cards. How well the player performs in the minigames determines the total score and emblems awarded, and as the score increases, so does the player's rank, which increases the difficulty of the minigames. Occasionally, the player will be able to choose where a character will go for side stories before progressing the main game. Rose Guns Days takes place in an alternate history Tokyo following the end of World War II. On April 1, 1944, Japan was largely destroyed by a natural disaster, bringing an abrupt end to the war. American and Chinese forces occupied Japan and contributed humanitarian aid, eventually causing a mass influx of immigration and cultural influence. The Japanese people became a minority within Japan and the Japanese language was rarely spoken in favor of English or Chinese. Rose Guns Days is 07th Expansion's fourth visual novel series. The scenario is written entirely by Ryukishi07, who also provides some of the character designs, which are divided between three additional artists: Jirō Suzuki, Sōichirō and Yaeko Ninagawa. The music of Rose Guns Days is provided by various music artists including both professionals and dōjin artists including: Dai, Luck Ganriki, Rokugen Alice, M. Zakky and Pre-holder. The first game in the series, titled Season 1, was released on August 11, 2012 at Comiket 82 and is playable on Windows PCs. Season 2 was released on December 31, 2012 at Comiket 83. Season 3 was released on August 10, 2013 at Comiket 84. The fourth and final game in the series, Last Season, was released on December 31, 2013 at Comiket 85. A version of Season 1 playable on iOS devices was released on November 9, 2012, followed by a version playable on Android devices released on December 13, 2012. All four seasons are also distributed by MangaGamer since February 7, 2014 for explicit use of the English translation patch. ↑ "Staff & Link" (in Japanese). 07th Expansion. Retrieved November 11, 2012. ↑ "Rose Guns Days Season 1" (in Japanese). Amazon.co.jp. Retrieved November 11, 2012. ↑ "Rose Guns Days Season 2" (in Japanese). Amazon.co.jp. Retrieved January 1, 2013. ↑ "無料版「RoseGunsDaysLite」と「RoseGunsDays-Season1」のiOS版が登場" [Rose Guns Days - Season 1 and the Free Version Rose Guns Days Lite Introduced as iOS Editions]. 4Gamer (in Japanese). Aetas. November 9, 2012. Retrieved November 12, 2012. ↑ "Rose Guns Days" (in Japanese). Seams. Retrieved April 18, 2013. ↑ "New Releases From 07th Expansion!". MangaGamer Staff Blog. February 7, 2014. Retrieved December 28, 2014. This page was last edited on 20 October 2017, at 01:50.